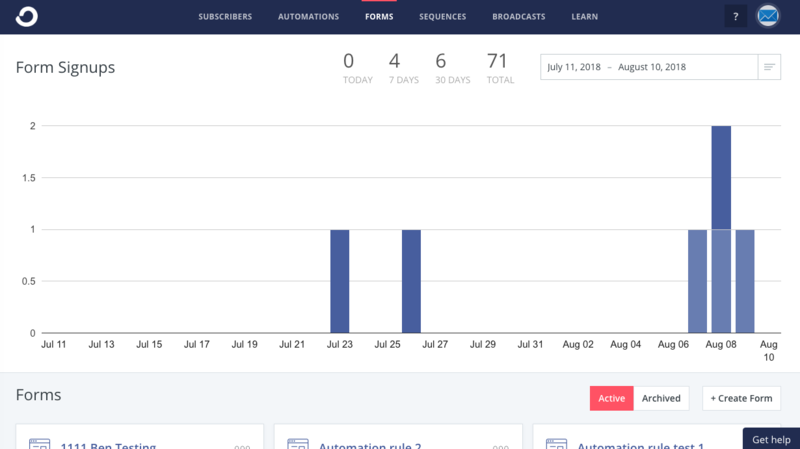 You have a few graph features to choose from within your account, including the Subscriber Graph and the Form Graph, which we'll go over now. Go to your Forms tab. When you click on Forms, the first thing you will see is the Form Graph. 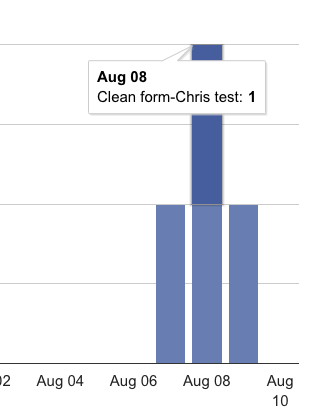 This graph measures how your Forms are performing, and measures the number of opt-ins per day, for each Form. • TODAY is how many opt-ins you have received today. • 7 DAY is how many opt-ins you have received in the last 7 days. • 30 DAY is how many opt-ins you have received in the last 30 days. • TOTAL is the sum of all of your unique, active Subscribers in your account. The bar graph visually represents opt in to particular Forms. Hover over particular bars to see total opt-ins to that Form, on a particular day. The default view of your Form graph will be the last 30 days, but you can change the date range by clicking on the date selector.